Gradle Build Tool – the fatest way to microservices ! Your DevOps tool stack will need a reliable build tool. Apache Ant and Maven dominated the automated build tools market for many years, but Gradle showed up on the scene in 2009, and its popularity has steadily grown since then. Gradle is an incredibly versatile tool which allows you to write your code in Java, C++, Python, or other languages. Gradle is also supported by popular IDEs such as Netbeans, Eclipse, and IntelliJ IDEA. If that doesn’t convince you, it might help to know that Google also chose it as the official build tool for Android Studio. While Maven and Ant use XML for configuration, Gradle introduces a Groovy-based DSL for describing builds. In 2016, the Gradle team also released a Kotlin-based DSL, so now you can write your build scripts in Kotlin as well. This means that Gradle does have some learning curves, so it can help a lot if you have used Groovy, Kotlin or another JVM language before. Besides, Gradle uses Maven’s repository format, so dependency management will be familiar if you have prior experience with Maven. You can also import your Ant buildsinto Gradle. The best thing about Gradle is incremental builds, as they save a nice amount of compile time. According to Gradle’s performance measurements, it’s up to 100 times faster than Maven. This is in part because of incrementality, but also due to Gradle’s build cache and daemon. The build cache reuses task outputs, while the Gradle Daemon keeps build information hot in memory in-between builds. All in all, Gradle allows faster shipping and comes with a lot of configuration possibilities. 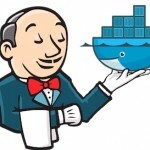 The idea : Make all your Build with Jenkins on always the same environment : controlled, stable ..
docker build -t wheezy_jenkins:jenkins . This howto will help you to begin with jenkins. Welcome on board ! Bienvenue ! Hope you will enjoy this blog, wiki, workshop site. I will try to share what you need about devops. Je me lance dans la mise en route de ce site mélangeant blog, wiki, Learning tips, vidéo,..etc..
A bientôt et rester connecté .